LA VILLETTA consists of two similar apartments, and is also available as a single house (please see below under Property Description). The Downstairs Apartment has many traditional Tuscan features, such as terracotta tiles, and beautiful chestnut wood beams. The backdoor leads onto a small terrace which leads to the large garden with spectacular mountain views. The sitting/dining-room has a sofa-bed (good as a sofa, but best for children if used as a bed), other seats, a fully equipped kitchen area, a dining table and chairs and a bookcase. The good sized bedroom has a large double bed, a folding single bed (usable in either room), a wardrobe, a chest of drawers, etc. The bathroom contains a shower, WC, and hand basin. Please feel free to get in touch by clicking on "Ask the Owner a Question" before requesting to book our property. Set in a small hamlet with spectacular views into the beautiful Pratomagno Mountains, the property includes an old house 'La Villetta', and a separate cottage 'La Capanna'. LA CAPANNA is on a single floor, and sleeps up to six people in two bedrooms and a very comfortable sofa-bed in the spacious sitting/dining-room/kitchen. It is very well equipped, has a wonderful panoramic view of the mountains through the window, and has off-street car parking. LA VILLETTA is a two-storey house containing two apartments, one on each floor, and each sleeping four people. These are listed and bookable separately on this website. Both apartments have a bedroom, a sitting/dining-room/kitchen and a bathroom. The apartments can be kept fully independent, each with its own entrance; or, by opening a door at the bottom of the stairs, the building can become a single house with three bedrooms, as the upstairs sitting room with its excellent double sofa-bed can easily function as another bedroom. Used in this is way the house can accommodating up to eight people, making it ideal for two families or groups wanting to holiday together. People considering booking both apartments to use the whole house should click on 'Ask the Owner a Question' for more information, including a discount in the cost.. BOTH HOUSES have recently been renovated so as to retain a traditional Tuscan character, and both have air conditioning and all necessary domestic facilities: fridge, freezer, washing machine, etc. THE LARGE GARDEN with superb views up into the mountains has flowers, lawns, pergolas, terraces with tables, BBQ’s, and lots of quiet corners. 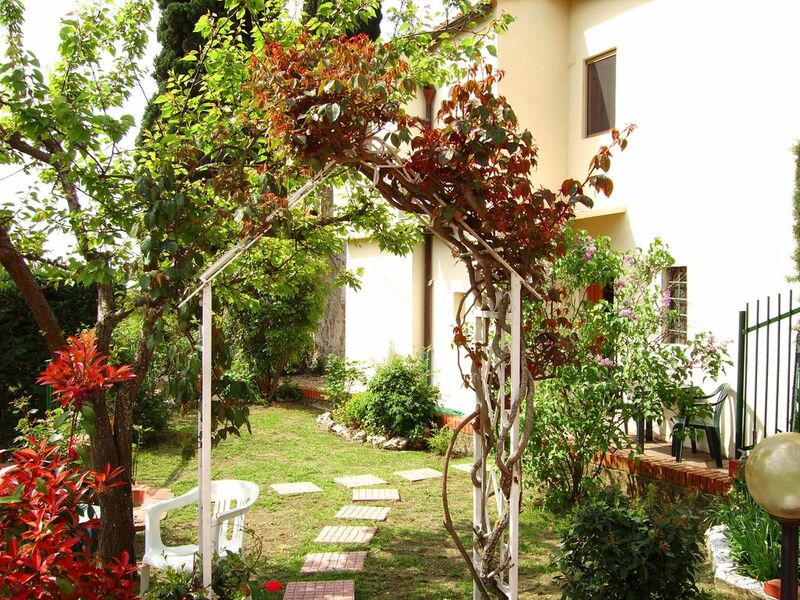 The property is near village of Cascia and the small country town of Reggello. It is about 35km south-east of Florence, in the direction of Arezzo (about 50km). This is classic rural Tuscany - old stone buildings and lines of cypress trees scattered among olive groves, and vineyards. The mountains offer superb scenic walks, and there is easy access by rail or motorway to Florence, Arezzo, Siena and beyond. The nearby village of Cascia has good restaurants, bars, shops and banks, an excellent swimming pool, and the local town has many more facilities. There is enough to do on holiday here to keep you happy for a lifetime! Email: pritchard.gwyn@gmail.com. I'm Gwyn Pritchard, a professional composer (classical) and Professor of Composition at Trinity Laban Conservatoire, London. My wife Claudia is a singer and singing teacher. We are currently in our early seventies - and getting younger every year!! Italy is obviously a passion, which is why we bought our property there. However, we love travel, not only to our Italian retreat or for concerts of my music in various countries, but also (when time and circumstances permit) to India, the far east and other far-off corners of the globe. Other passions we share include painting and sculpture, the theatre, good wine, and above all each other's company. We have two adult daughters - one a composer like, her father, the other an actress (who you may well have seen on the TV). We chose La Villetta when we were looking for a place near Florence where we had many friends and so visited the area often. When we saw the stunning setting of the property we had no doubt it was the place for us, especially as it is ideally located for easy access to everywhere we wanted to visit, as well as for all the things we like to do. When the neighbouring house, La Capanna, came on the market we bought it both to guarantee the continued privacy and tranquility of La Villetta and also to enjoy it's extensive garden. We never cease to be amazed by the sheer beauty of the mountains behind the property, especially the ever-changing light on the trees, which we can enjoy whilst sitting or dining in the large garden. The mountains offer some of the best walking in Tuscany, but for anyone who wants less strenuous activity there are numerous artistic and architectural delights locally, or excellent restaurants serving delicious local fare. The wines and oils from this area are world renown and can be bought directly from the producers. For sheets and towels there is a fee of £8 per person per set (1 set for 1 week, 2 sets for longer stays) . This will be added to the quote once we know the number of people booking and the duration. The washing machine is in a shed in the garden, and is shared with guests of the other apartment. Roadside parking very near the house. The living room contains a sofa-bed (good as a sofa, but not ideal as a bed for heavier adults - OK for children), other seats, the dining table and chairs, a table, coffee tables, a book case, etc. The kitchen is well equipped, with a gas cooker, plenty of cooking and eating utensils and sufficient plates, cups and glasses for five people. The dining area, in the sitting room/kitchen, has a good sized table and four dining chairs. There is a small CD players. There is a wide range of books for all ages, including novels and local guide books and maps. The large garden has superb views into the mountains, with flowers, lawns, shrubs, herbs, pergolas, terraces with tables for outdoor eating, and lots of quiet, private sunbathing spots. Paradise!! The Ugolino Golf Course is just south of Florence on the ancient Chianti road between Florence and Siena, and is easily reached by car in about forty minutes. There is a small step up top the front door. Access to the back door is via a narrow path with walls either side. Very good, and in easy walking distance from the house, with grass areas, sun-loungers, etc. Another, 3km/2miles - ideal for young children. A cleaning service is available, and a local cook will prepare an excellent five course dinner including wine for 30 euros. La Villetta is a charming rustic cottage in the middle of the Italian countryside. After not following the owners directions we foolishly followed Google Maps to the wrong place. Don't do it follow Gwyn's advice! The gardens are lovely with lots of nooks and corners to hide from the heat and relish the sun. The variety of creatures in the garden is amazing from bees to lizards and butterflies to birds - endless delight. The cottage is rustic so don't expect mod-cons but everything you need is there (other than a coffee maker) and La Villetta was superbly cool even in 34°C we used the air-con on the first day to freshen the rooms then didn't touch it again. Perfect ancient cooling technology working perfectly!! We relaxed completely in our stay it was easy!! A quick shout-out to the vegan/vegetarian restaurant Serendipity in Cascia - superb food in a quirky setting!! A peaceful setting with wonderful mountain views. Our extended family stayed in two of the properties, both of which were charming and very well equipped with everything you could possibly need. We spent a lot of time in the beautiful garden with its many seating areas, all with fabulous views. The houses are a short walk to the local village with cafes, restaurants and a great swimming pool plus a good supermarket. There is lots to do locally and Florence is very close and easily reached by car or train. All communications with the owner were clear and easy and lots of helpful information was provided. We will definitely return soon and would highly recommend this property to others. it is a fantastic place. beautifull, clean, comfortable, spacious, pittoresque, silent and near to all cities within the region. go there and enjoy your time. We stayed in the downstairs apartment of La Villetta which was clean, comfortable and had everything we needed for our week's holiday. The garden is beautiful with lots of seating areas to enjoy the great views of the Tuscany hills. The nearby villages had nice restaurants and a convenient supermarket. The villa is centrally located and we hired a car to see lots of wonderful places. Gwyn and Claudia's instructions and information guides were excellent as was their customer service. We had a great Tuscan holiday! Fantastic place - amazing views! The house is fantastic - it's warm and welcoming and is fully kitted out with everything you might need. Wonderful views and really helpful owners - highly recommend! We are delighted you had such a good time, and enjoyed our holiday home. You are, of course, welcome to join the list of people who return there regularly. Charming, cozy and great value for money! I've stayed here a couple of times (in both summer and winter) and really love this place. The house is simply but well equipped and very welcoming. The garden is lovely and the views are wonderful. Although it's situated in a quiet little hamlet, there is easy access (very nice walks!) to the local village and nearby town and just a 30-minute drive to Florence. I hope to return again soon. The sea is easy to reach by train or motorway e.g. Marina di Pisa or Viaréggio or Castiglioncello (120 to 150km) but the coast west of Florence can get very busy. We recommend a longer journey to Marina di Alberese (a nature reserve, so no shops etc.) just south of Grosseto (about 200km). Nearest airports are: Florence 40km (very few flights), Pisa 127km (best option) or Bologna 141km. Car hire is recommended but not essential. For getting about locally there are 2 mountain bikes for the use of visitors. The nearest village is Cascia at about 1km, and the small town of Reggello is 2km. Figline Valdarno (shopping, market and station) and Incisa (motorway) are both about 8km. The local countryside is superb for walking. Other activities available locally include swimming, horse riding and fishing. There are plenty of shops close by for all basic necessities, including a modern supermarket, a chemist, banks and several restaurants. There is a local market on Saturdays. Excellent wines can be bought directly from local producers. For people interested in finding a real bargain in the world of ‘haute couture’ a nearby shopping centre called The Mall is home to the factory outlets of Gucci, Giorgio Armani, Yves Saint Laurent, and other top designer labels. Not far away there is a similar Prada outlet. There is a 10% discount for all 2-week bookings, and also for 2 apartments for 1 week. All prices are for 2 people per apartment in the main house or in the cottage. For all additional people there is a surcharge of £4 per person per night to cover the increased utility costs. Use of sheets and towels, if requested, is charged at £8 per person per week. Negotiable discounts are available for last-minute and long period bookings. Please email or phone for details. A payment of 50% is payable at the time of booking, and the remaining amount should be paid 30 days before the first day of the booked period. Prices are in UK Pounds, but payments may in some cases be accepted in euros. Changeover days are usually Saturday in peak season but are always negotiable when necessary.